In a showstopper arrangement that will captivate the eye and delight the nose, the Tiffany Petals scalloped vase bursts with some of the most enchanting blooms available. The luscious purple hues above are doubled by the tints in the elegant vase below, just as the voluptuous scent of dark-violet lilac is perfectly complemented by the tulip's rich texture. What else says luxury like Tiffany, tulips and lilac? Only from Beautiful Orchids (the cherry wood stand is not included; the vase and flowers are shipped separately). 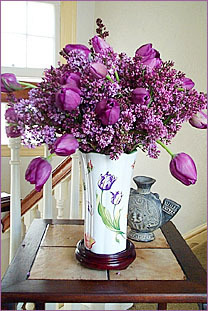 The arrangement above was created with exactly 20 stems of freshly cut Dutch Purple Tulips and a bunch of Californian Violet Lilac (20 stems) on a Tiffany Petals Scalloped vase (8"H x 4.5"W). The brunches and tulips are cut short for a full dramatic arrangement. The vase is shipped with the blue Tiffany box along with the flowers. Your purchase is complete with an exquisite gift card, your personalized sentiment and care instructions.